With gas prices at an all-time high, car manufacturers have been looking at alternatives to gasoline for some years now. The leading car companies have rolled out hybrid cars, electric cars, and cars that run on alternative fuels. Most of those cars that run on alternative fuels have been compact cars, mid size sedans, and full sized sedans. Most SUV’s and trucks run regular gasoline or diesel; they consume a lot of gas which leaves a sizeable hole in the driver’s pockets, because they cost a lot of money to fill up. Ford is trying to change the way people look at trucks now, they recently showcased the new F-150 model which runs on Compressed Natural Gas, (CNG) the truck can run on just the natural gas, and also comes in the bi-fuel editions for people who do not have access to natural gas infrastructure all the time. The trucks that have diesel engines are capable of running on Biodiesel. This means that all of Ford’s commercial vehicle lines are capable of running on natural gas, or propane. This makes Ford the front runner when it comes to making vehicles that run on alternate fuels. The idea behind the F-150 run on CNG was because fleet customers kept asking when the company will start making fuel efficient trucks that would save them some money. They took the requests into consideration, and came up with the CNG powered F-150, which they fully expect to be a cross over vehicle and anticipate a lot of sales because people who had trucks but had to trade them in because of the high cost of gas, can now go back to driving their trucks. 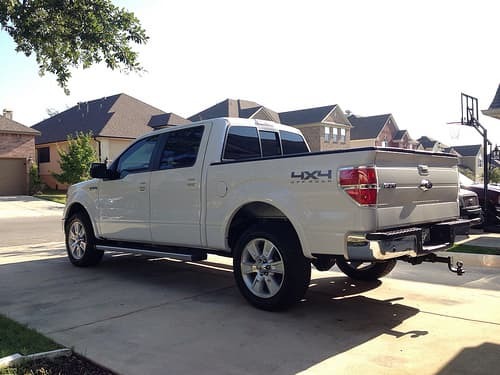 Also people who use the trucks for work like construction workers and farmers can save a lot of money by switching from their current truck to the new CNG powered F-150s. The only disadvantage to buying the new F-150 is that owners wouldn’t be able to use the natural gas truck unless they are in urban areas that have infrastructures for cars like that; the bi-fuel technology would still save them money over regular one fuel engine trucks. At the rate the company is going, it wouldn’t be surprising if Ford becomes the first company to make a fully electric powered truck, or electric hybrid truck. They already have a sedans that are fully electric, and hybrids, so it wouldn’t be much of a shock.